Gain visibility and control with deep insights into the performance of your marketing investments. Turn more marketing dollars into revenue dollars. Be a hero! Marseli Revenue Intelligence generates the information B2B demand generation leaders need to plan or update marketing investments. 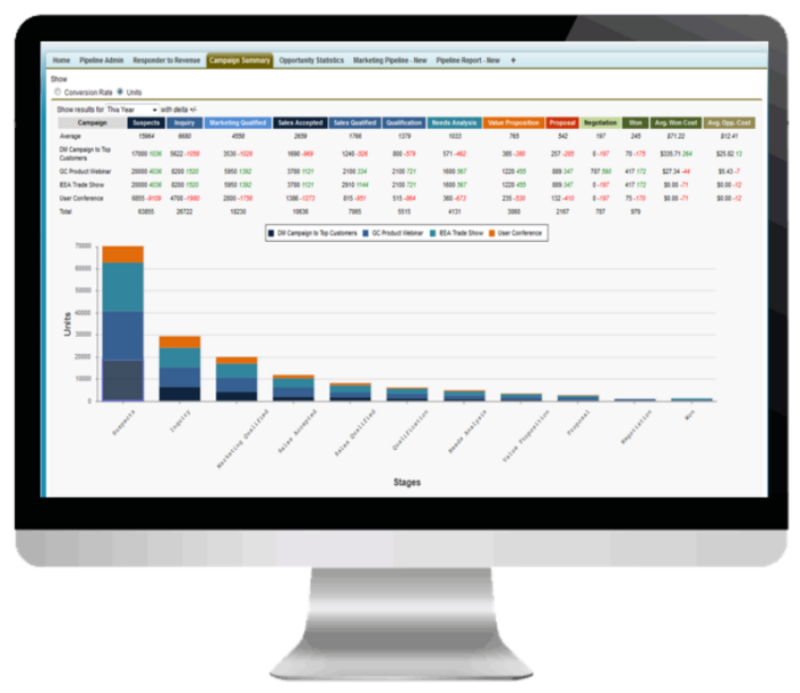 With Marseli Revenue Intelligence, you now have the insights from your sales pipeline that have been missing. It's the critical stage-to-stage sales intelligence you need to truly generate more qualified leads that convert to opportunities your sales team will act on. Marseli is predictive by design, it will not only help you prove true performance, but also allow you to accurately manage your marketing impact. Measure performance from inquiry-to-revenue and all stages in between. Yep, you read that right. For the first time you can integrate both your nurture stages and your sales stages in one report. Review campaign and tactic investments and drill all the way to individual opportunities and sales reps. Benchmark performance. You have to know how you stack up. Benchmark the performance of marketing-sourced opportunities against other sources such as sales, partner or inside sales. See how your investments perform in terns of conversions, win and loss rates as well as sales cycle times and leakage points. Compare against the Marseli benchmark database as well to see how you stack up against your peer set. Know which tactics, campaigns and lead scores work best for sales. Sales is marketing's customer. Knowing what sales needs and the types of opportunities that work best for them are key to marketing's success. With Marseli Revenue Intelligence, you will have the insight to understand the needs of your sales team and deliver quality opportunities that build pipeline. It's really cool stuff. One-click access to dozens of best practice KPI. Get immediate access to hard-to-get KPI in simple, interactive dashboards. You don't need big data, just the right data. We've already done the work for you. Historical, current and future pipeline units and values. Historical and current stage velocity. Stage leakage in units and value. Sales activity and behaviors by campaigns. Built-in ROI for both pipeline and revenue impact measurement.